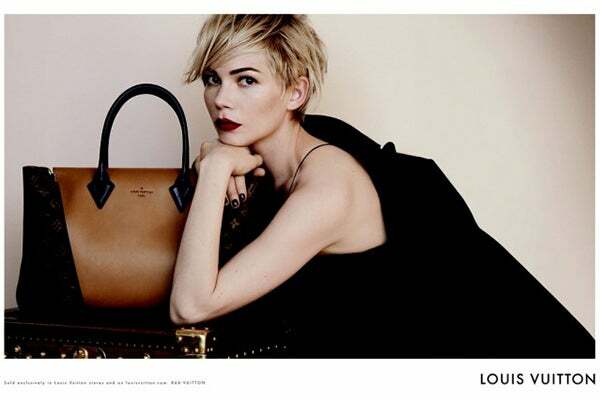 It doesn't exactly surprise us that Louis Vuitton chose the manic-pixie-haircut-dream-'do-sporting Michelle Williams to front its fall campaign. The actress has proved in the past that she prefers the French fashion house when it counts, and naturally, the feeling was mutual. Propped next to the newest W handbag design, Williams masters a dark, romantic look in pieces from the LV collection and scores major beauty points for the perfect deep-red lip and nearly black nails. Sure, everyone (and Adam Levine) has their opinions on celebrity endorsements, but this new collab for fall '13 feels like Vuitton has found the yin to its yang. With a balance between the handbag's classic, clean structure and Williams' soft-yet-edgy demeanor, we're all sorts of excited to see how this pretty snap, lensed by Peter Lindbergh, will look spread across a glossy September issue.